I want you to imagine the contretemps in such a Jane Austen comedy of manners–one man orders an invasion of Iraq thinking it might impress the other man, and the other man goes along so as not to appear fussy. What you get is an Iraq War and an unwanted scone. But that’s a bit disingenuous. Rummy is not polite to anybody, not the Bush family nor his colleagues nor John McCain. It seems like he’s willing to trash everybody and anybody for the failures of the war he prosecuted. That’s the mark of a true independent spirit or a psychopath. Did it occur to anybody that the insurgency would start in Iraq because Iraqis understood the invasion better than we did? Was it not anticipated they might fight back because no matter how much they hated their leader, they knew the American reasons for invasion were based on revenge and perhaps worthy of resisting? The reasons for invasion were convoluted. There is part of me that secretly believes it allowed us a way to save face as we completely capitulated to Osama Bin Laden’s demands that we leave Saudi Arabia. Conservatives like to point out that there were no more 9/11s after Iraq. They won’t point out that it’s because we gave the horrible Saudi jackal what he wanted. Someday we’ll all have to leave Iraq–physically and emotionally. 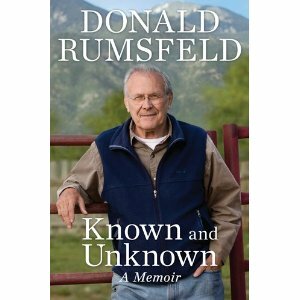 But it will be hard as long as self-serving careerist bureaucrat resume jockeys with blood on their hands like Rumsfeld roam loose and drag our nation through the pain one more time, not for the good of a country but for his own soulless vanity.